Existing-home sales eased in June as contract cancellations spiked unexpectedly, although prices were up slightly, according to the National Association of Realtors®. Sales gains in the Midwest and South were offset by declines in the Northeast and West. Single-family home sales were stable while the condo sector weakened. Total existing-home sales1, which are completed transactions that include single-family, townhomes, condominiums and co-ops, declined 0.8 percent to a seasonally adjusted annual rate of 4.77 million in June from 4.81 million in May, and remain 8.8 percent below the 5.23 million unit level in June 2010, which was the scheduled closing deadline for the home buyer tax credit. The national median existing-home price2 for all housing types was $184,300 in June, up 0.8 percent from June 2010. Distressed homes3 – foreclosures and short sales generally sold at deep discounts – accounted for 30 percent of sales in June, compared with 31 percent in May and 32 percent in June 2010. According to Freddie Mac, the national average commitment rate for a 30-year, conventional, fixed-rate mortgage was 4.51 percent in June, down from 4.64 percent in May; the rate was 4.74 percent in June 2010. Phipps added that lower mortgage loan limits, due to go into effect on October 1, already are having an impact. “Some lenders are placing lower loan limits on current contracts in anticipation they may not close before the end of September. As a result, some contracts may be getting cancelled because certain buyers are unwilling or unable to obtain a more costly jumbo mortgage,” he said. Total housing inventory at the end of June rose 3.3 percent to 3.77 million existing homes available for sale, which represents a 9.5-month supply4 at the current sales pace, up from a 9.1-month supply in May. All-cash transactions accounted for 29 percent of sales in June; they were 30 percent in May and 24 percent in June 2010; investors account for the bulk of cash purchases. First-time buyers purchased 31 percent of homes in June, down from 36 percent in May; they were 43 percent in June 2010 when the tax credit was in place. Investors accounted for 19 percent of purchase activity in June, unchanged from May; they were 13 percent in June 2010. The balance of sales was to repeat buyers, which were a 50 percent market share in June, up from 45 percent in May, which appears to be a normal seasonal gain. Single-family home sales were unchanged at a seasonally adjusted annual rate of 4.24 million in June, but are 7.4 percent below a 4.58 million pace in June 2010. The median existing single-family home price was $184,600 in June, up 0.6 percent from a year ago. Existing condominium and co-op sales fell 7.0 percent to a seasonally adjusted annual rate of 530,000 in June from 570,000 in May, and are 18.0 percent below the 646,000-unit level a year ago. The median existing condo price5 was $182,300 in June, up 1.8 percent from June 2010. Regionally, existing-home sales in the Northeast fell 5.2 percent to an annual pace of 730,000 in June and are 17.0 percent below June 2010. The median price in the Northeast was $261,000, up 3.1 percent from a year ago. Existing-home sales in the Midwest rose 1.0 percent in June to a pace of 1.04 million but are 14.0 percent below a year ago. The median price in the Midwest was $147,700, down 5.3 percent from June 2010. In the South, existing-home sales increased 0.5 percent to an annual level of 1.86 million in June but are 5.6 percent below June 2010. The median price in the South was $159,100, down 0.1 percent from a year ago. Existing-home sales in the West declined 1.7 percent to an annual pace of 1.14 million in June and are 2.6 percent below a year ago. The median price in the West was $240,400, up 9.5 percent from June 2010. I have recently seen so many out of state license plates and have spoken to folks that either have, or are, thinking of relocating to Washington. In Snohomish County a large part of them, I assume, are being transferred here by Boeing but regardless thinking of relocation can be a huge decision and take some serious thought. It’s a good idea to weigh the pros and cons of such a move and how it would impact you. A good place to start would be with salary comparisons and the income level you would need to be comfortable. Here are some great sites with user-friendly calculators that can help you and even if you are not planning to move to another state or county there is still some very fun and interesting tools to check out. American Institute for Economic Research– See how your salary last year measures up today. Bankrate.com– Calculate relocation equivalents and expenses in dozens of categories, from home price and rent to goods and services. CityRating.com– Calculates the cost of living in two different states based on your current income. Pay Scale– Looks at cost of living calculations between U.S. cities with graphs that chart increases or reductions in specific services. Salary.com– Explore cost-of-living differences based on old and new home and work locations with brief analysis about the move. Thanks to the Everett Herald for some very useful information. Find your new house with a click of a mouse! Some Details about the USDA Home Loan Program in Washington State and no I’m not talking about steak! If you wonder where, you can buy a home with a rural development (USDA) loan here’s a map. The area inside the outlined area is considered urban and is NOT eligible for rural development housing programs. Hence, homes in Snohomish county located outside of the area outlined in the map should be geographically eligible for a USDA loan (see the official description of borders below). 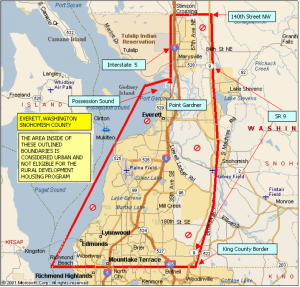 The ineligible area of Snohomish County Washington includes all of the area South of 140th Street NW, West to Interstate 5. South on Interstate 5 to the water in Possession Sound at Port Gardner. 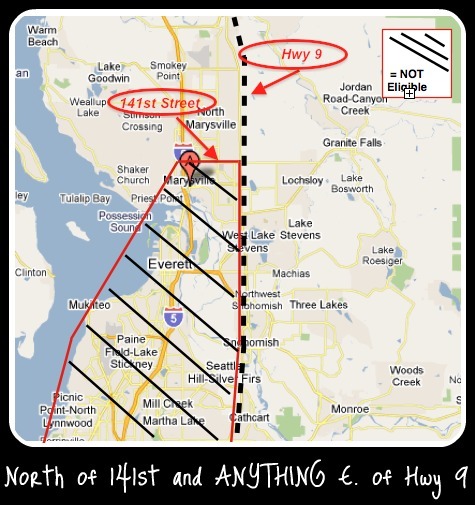 Following the coastline South to the King County Line, East long the King County line to State Route 9. North on State Route 9 to 140th Street NW. Note: Word has it that USDA is possibly changing some of these guidelines in the fall. What I have heard is that mortgage insurance might be coming into this type of loan. This is not validated yet but with FHA climbing from 3% down to 3.5% last fall it might be true. This can affect a purchasers buying power! If you know of anyone thinking of buying with a USDA loan have them contact me so we can get them into a home now and save money. There are so many events and activities going on around the Puget Sound I could go on forever! Since I can’t I am focusing on the Snohomish County area but I am posting a link to Seattle area festivals (July and August)and please if you know of a good one around the greater Puget Sound Region feel free to post. July 9th – Run of the Mill in the Mill Creek Town Center. This run has become one of the most exciting 5k’s in Washington State, with some of the fastest runners in the nation competing for prize money. But the best part is it’s for everyone! Register– lace up those sneakers and have fun! Starts at 9:30 am. Speaking of Mill Creek how about some music? Mid-week 2011 concert series at the forum from 6-8. And on Thursday head on over to Lake Stevens for some music! “Music on the Lake” Free Summer Concerts Lake Stevens 2011 are presented by the Lake Stevens Arts Commission. 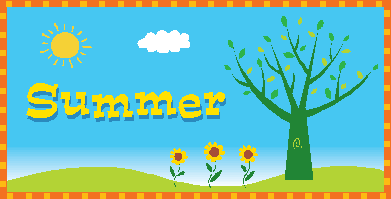 They will take place on Thursdays, July 7 – August 18, 2011, from 7:00 p.m. – 8:30 p.m. at North Cove Park, Lake Stevens. July 9, 2011 Mukilteo:10:00 AM to 4:00 PM : Flying Heritage Collection Flying Heritage Collection’s Fly Days are here! Watch rare vintage aircraft put through their paces, just as they did in WWII. Special event on July 16th B-25 Dubut. Also, don’t forget the great Farmer’s Market down on the waterfront every Wednesday starting at 3:00. I got a pound of Rainier cherries for 4.50 a pound! Num! Main stage entertainment at the beer garden, pet plaza, food court, car show, arts and craft booths, kid’s area with bouncy toys, games and activities and FREE shuttle from Jackson High School. Parade, NBA Star Jon Brockman and so much fun for the whole family! 7/22-8/19 Cinema under the Stars. Friday evenings with pre-show entertainment at 7:30. Outdoor movie at Thorton A. Sullivan Park and Silver Lake. 7/29-7/31 Lake Stevens Aquafest Community Festival. Carnival and fireworks! Car show, boat races, art show and so much more. >Sell Your Home Fast and other great home-owner tips. >Sell your house fast and other home-owner tips. Signing a long term listing agreement without a written performance guarantee. Failing to obtain a pre-approved mortgage for ones next home. Nearly three-quarters of homeowners claim that they wouldn’t use the same realtor who sold their last home. Dissatisfaction boils down to poor communication which results in not enough feedback, lower pricing and strained relations. Another FREE report entitled 10 Questions to Ask Before You Hire an Agent” gives you the straight, to-the-point questions you should be asking when you interview agents who want to list your home. You can obtain a FREE copy of this report from my website. You may not be able to change your home’s location or floor plan, but you can do a lot to improve its appearance. The look and feel of your home generates a greater emotional response than any other factor. Clean like you’ve never cleaned before. Pick up, straighten, unclutter, scrub, scour and dust. Fix everything, no matter how insignificant it may appear. Present your home to get a “wow” response from prospective buyers. You may be surprised to know that some marketing tools that most agents use to sell homes (eg. traditional open houses) are actually not very effective. In fact only 1% of homes are sold at an open house.